In a historic bilateral summit, Russian President Vladimir Putin met his US counterpart Donald Trump in the Finnish capital. In an interview with Sputnik, Dr. Denis Rancourt, a civil rights advocate and social theorist, provided his insight into the importance of the meeting. Sputnik: Could you share your feelings as to how significant this is; how significant is the timing of this? What do you expect to be accomplished? Dr. Denis Rancourt: I don’t think the timing is that important, I mean it had to happen because Trump and the US want it to happen and also Russia wants it to happen. It’s going to happen anyway. The US wants things from Russia and to some degree, the US needs Russia more than Russia needs the US, because the United States in the world has lost a lot of credibility and Russia has credibility. It has a coherent diplomacy, which the US no longer has. So it needs that credibility… Trump uses the expression “We need to run the world”: what he means by that is that he wants to be able to acquire the benefits of having a collaboration with Russia on certain issues. I think that credibility is one; but there is another important issue that clearly is of concern to Trump and the United States and that is the question of weapons; the democratizing of missiles, especially. The US would have a lot to lose if more and more nations acquire the possibility of defending themselves against US threats and attacks. And so, the possibility of missiles being given to people who need them, by Korea or by Iran, or even indirectly, or directly, by Russia itself, is a great threat to the United States, because the US system relies on military intimidation and its projection of power in the world. So, for that to be removed would take away many of its acquired territories and ability to coerce and intimidate economies and large parts of the world. I think those are the things, it’s in that sense that the United States wants kind of a weapons management and understanding that they are going to limit this […] spread of weapons; because it’s not just nuclear weapons. Technology is advancing, and we now have more and more accurate missile that can hit cities that are estimated to be the source of military intimidation. For example, Tel Aviv can be hit by missiles and so on. It’s illustrated by what’s happening in Yemen now. The Yemenis have rudimentary missiles that are able to hit targets in Saudi Arabia and have demonstrated their ability to take our ships. So, the US is more and more vulnerable to this advancing technology. It relies on projection of power through aircraft carriers, which are themselves, by their nature, vulnerable to missile attacks and to the kind of technology that can easily hit large ships. They need to be able to protect themselves and they’ve lost credibility, especially after the total destruction that they have made in Iraq and Libya. The world has seen this and understands how vicious NATO and the United States can be. I think it’s a combination of those two things that brings Trump and the US to the table, to try to negotiate with Russia. Sputnik: […] Trump has virtually dismissed reports, even from his own intelligence, on the alleged Russian meddling. What do you think about this? Dr. Denis Rancourt: […]Of course this is a global war. Of course, RT and Sputnik exist now and that’s a reality, and it influences opinions and outlooks in the world, and that’s not going to change, it’s not going to go away. This is all largely a domestic issue, whether it’s true or not, it’s still just a domestic issue. Vladimir Putin laughed after being asked if Russia had compromising information about Donald Trump or his family, replying that it’s absurd to suggest that Moscow collects dirt on every American businessman who visits the country. Trump added that if there was compromising information about him, it would have been published long ago. While the Russian leader’s answer was hardly ambiguous, journalists flocked to Twitter to claim that Putin had not denied that Moscow had dirt on Trump. The theory that Moscow has dirt on the US president stemmed from the so-called ‘Steele Dossier,’ which – among other sensational but ultimately unproven allegations – claims that Trump paid prostitutes to urinate on a bed in which Barack Obama once slept. The dossier, written by retired UK intelligence officer Christopher Steele and allegedly compiled using sources from “inside the Kremlin,” has been repeatedly cited by Russiagate enthusiasts who claim that Donald Trump is a Kremlin puppet. “You have been watching one of the most disgraceful performances by an American president at a summit in front of a Russian leader that I have ever seen,” CNN anchor Anderson Cooper declared at the end of the joint press conference. “Trump declines to side with US intelligence over Putin” blared a CNN chyron a little while later, as anchor Wolf Blitzer somberly declared the “Russians must be high-fiving each other” following the summit. CNN has been openly confrontational with Trump since before his inauguration and the president has called them “fake news” on more than one occasion – most recently during his visit to the UK. The network’s White House correspondent Jeff Zeleny was appalled that, instead of confronting Putin publicly, Trump brought up the Democratic National Committee servers – which the FBI never inspected – as well as servers of House Democrats managed by Imran Awan, a Pakistani national who was recently convicted of wire fraud. Russia’s “invasion” of Crimea, the shooting down of the MH17 passenger jet, the “novichok” poisoning in Salisbury – all the favorite talking points the US politicians and media have used to attack Russia since 2014, without offering any proof – “none of it matters now,” Chance lamented. Putin admitted he’d wanted Trump to win the presidency and Trump castigated the FBI instead of Russia, New York Times correspondent Peter Baker chimed in. Republicans have traditionally been more suspicious and skeptical of Russia than Democrats but, in light of the summit, they now either have to oppose the president of their party or accept that “President Putin is really running the show,” Baker argued. Evelyn Farkas, the former State Department official in charge of Russia during the Obama administration, declared it “despicable” that Trump was siding “against democracy,” reminding viewers she’s descended from Hungarian immigrants who fled a Soviet crackdown in 1956. “We have to defend Langley, we have to defend the US,” Farkas added. Earlier, MSNBC had interviewed Michael McFaul, the former US ambassador to Russia. Even Fox News, accused by Democrats of being a propaganda network for Trump, had several anchors blasting the president. Neil Cavuto of Fox Business thought it was “disgusting” that Trump did not use the press conference to publicly accuse Putin of interfering in the 2016 election. Brett Baier, who hosts Special Report, wondered how exactly the summit might improve US interests and brought up the Republican lawmakers who were putting out statements against the summit, such as Senators Lindsey Graham (R-South Carolina), Ben Sasse (R-Nebraska) and Jeff Flake (R-Arizona). Fox anchors were also puzzled by Putin’s offer to interrogate suspects in the presence of Mueller’s investigators, as long as the US would allow Russian prosecutors to question Americans suspected by Russia of crimes, as outlined in a treaty going back to 1999. As to what the summit may have produced in terms of nuclear disarmament, peace in the Korean Peninsula, resolving the conflicts in Ukraine and Syria, or ratcheting down tensions in Europe… no one in the US media seemed interested in asking. He also expressed skepticism as to why the two presidents discussed matters in private, stating that Trump lacks credibility and is probably hiding something from his advisers. Brennan also called on Trump’s team to resign in protest against his “performance” in Helsinki on July 16, saying that no “good American patriot” would stay with Trump after that. “He criticized American citizens, Secretary Clinton, and others as opposed to really taking advantage of a world stage with all the world’s eyes upon them to point out how unacceptable Russia’s behavior and interference in our election […] But he just shirked those responsibilities,” Brennan said. “Not only did President Trump fail to speak the truth about an adversary; but speaking for America to the world, our president failed to defend all that makes us who we are — a republic of free people dedicated to the cause of liberty at home and abroad,” McCain wrote on his website. Former US Ambassador to Moscow Michael McFaul, a strong Kremlin critic banned from Russia over harming bilateral ties, mocked Trump’s statements in which he said that the US has been to blame for deteriorating relations between America and Russia. McFaul suggested that Trump should have blamed Moscow instead. “For President Trump to just insinuate as he just did in his initial remarks today, well bygones — let’s forget about all that stuff and move on because I want a great relationship with you, Putin. That’s just not serving America’s national interest, in my view,” former envoy said. Democrat Senator Jeff Merkley suggested in an interview with BuzzFeed News that Moscow is “likely” to have compromising material on Trump, claiming that it is a “standard strategy of Russia” for important visitors to the country. He further speculated that Moscow might have the so called “pee tape” allegedly depicting Trump ordering two prostitutes to urinate on a bed in at the Moscow Ritz-Carlton, where Obama’s family once stayed. US Senator Lindsey Graham slammed Trumps speech at the press conference by saying that it was a “missed opportunity” to hold Russia accountable for the alleged meddling in the 2016 election. He further claimed that the speech will be seen as a sign of weakness in Kremlin, going on to suggest that Trump should check the soccer ball that Putin gave him during the conference to see if it is wired. US Republican Senator Bob Corker said in a comment regarding the Helsinki summit that he wants the US to improve relations with Russia, but added that Trump should have been more forceful when he addressed issues with Putin. US House Minority Leader Nancy Pelosi criticized Trump for not confronting Putin in regards to alleged Russian meddling in the presidential election, days after the Justice Department accused 12 Russian intelligence officers of involvement in the interference. US President Donald Trump and his Russian counterpart Vladimir Putin met in Helsinki on July 16 and discussed an array of international issues, including the countries’ bilateral relations. The two presidents called the meeting highly “successful” and “productive,” saying that it was just the first step. Trump and Putin agreed to enhance their cooperation in Syria, particularly regarding the delivery of humanitarian aid and securing the Israeli-Syrian border. Both presidents also pledged to continue the ongoing cooperation between their armed forces in Syria and on preventing terrorist attacks. The two leaders also discussed the alleged Russian meddling in the US presidential elections. During the press conference, Putin assured that Moscow had not colluded with Trump’s election campaign and would never intervene in the US electoral process. Trump said that Russia had “zero reasons” to meddle in the elections and said that his victory was due to his “brilliant” campaign. The US president also scolded the Democratic Party and Hillary Clinton for fueling special counsel Mueller’s investigation into the alleged meddling, saying that it has negatively affected US-Russian relations. The United States has expressed readiness to initiate direct talks with the Taliban in an attempt to end a 17-year-old war in Afghanistan, a significant shift in American policy in the conflict-ridden country. Carlos Lozada, the nonfiction book critic for the Washington Post, promised “an honest investigation” of whether truth can survive the Trump administration in the lead article in the paper’s Sunday Outlook section. He delivered considerably less. 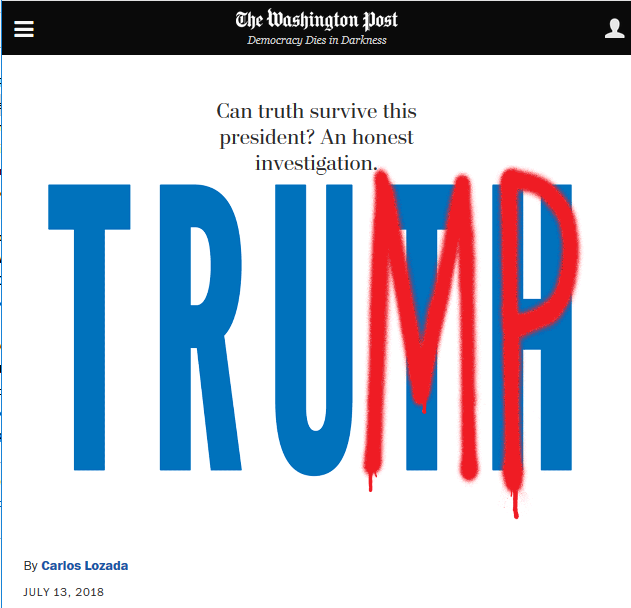 The Washington Post fails. But, hey, it’s the Washington Post. Most importantly and incredibly, Lozada never considers the possibility that respect for traditional purveyors of “truth” has been badly weakened by the fact that they have failed to do so in many important ways in recent years. Furthermore, they have used their elite status (prized university positions and access to major media outlets) to deride those who challenged them as being unthinking illiterates. This dynamic is most clear in the trade policy pursued by the United States over the last four decades. This policy had the predicted and actual effect of eliminating the jobs of millions of manufacturing workers and reducing the pay of tens of millions of workers with less than a college education. The people who suffered the negative effects of these policies were treated as stupid know-nothings, and wrongly told that their suffering was due to automation or was an inevitable product of globalization. These claims are what those of us still living in the world of truth know as “lies,” but you will never see anyone allowed to make these points in the Washington Post. After all, its readers can’t be allowed to see such thoughts. This was far from the only major failure of the purveyors of truth. The economic crisis caused by the collapse of the housing bubble cost millions of workers their jobs and/or houses. While this collapse was 100 percent predictable for anyone with a basic knowledge of economics, with almost no exceptions, our elite economists failed to see it coming, and ridiculed those who warned of the catastrophe. Incredibly, there were no career consequences for this momentous failure. No one lost their job and probably few even missed a scheduled promotion. Everyone was given a collective “who could have known?” amnesty. This leaves us with the absurd situation where a dishwasher who breaks the dishes get fired, a custodian that doesn’t clean the toilet gets fired, but an elite economist who completely misses the worst economic disaster in 70 years gets promoted to yet another six-figure salary position. And, departing briefly from my area of expertise, none of the geniuses who thought invading Iraq was a good idea back in 2003 seems to be on the unemployment lines today. Again, there was another collective “who could have known?” amnesty, with those responsible for what was quite possibly the greatest foreign policy disaster in US history still considered experts in the area and drawing high salaries. When we have a world in which the so-called experts are not held accountable for their failures, even when they are massive, and they consistently look down on the people who question their expertise, it undermines belief in truth. It would have been nice if Lozada had explored this aspect of the issue, but, hey, it’s the Washington Post. Dean Baker is the author of Rigged: How Globalization and the Rules of the Modern Economy Were Structured to Make the Rich Richer. My old teacher and mentor, Elie Kedourie, Professor of Politics at the University of London liked to say that Clio, the Greek muse of history had a great sense of humor and irony. This thought comes vividly to mind rereading one of the most important books ever written on the causes of the decline and disintegration of the British Empire in the first half of the 21th century, Correlli Barnett’s The Collapse of British Power. Barrett’s enormous and still controversial masterpiece was published in 1972. Yet today it has a greater relevance than ever. For every time “Britain” is mentioned in the text, cross the word out, then replace it with “the United States” or “America” and his explanations for British decline and fall apply and explain even more presciently the current dilemmas of the United States. Barnett gave as major reasons for the collapse of British power strategic over-extension after World War I when the British, already administering an empire covering one quarter of the entire land territory and one quarter of the human race, stretched even further and saw themselves as the global hyper-power and police, charged with maintaining a true World Order across the entire planet. Today, those words and conceptions have an especially eerie and contemporary ring. By claiming to be the global hyper-power, Barnett cogently argued, the British instead guaranteed that they could not even remain as an international superpower. They overextended and exhausted themselves. They over-stretched and exhausted their land combat forces in a plethora of minor wars and counter-insurgencies around the world, most notably in Iraq, Palestine, Ireland and Afghanistan – all regions that have today an astonishingly contemporary ring. In the end Britain’s imperial leaders extended their network of guarantees to the tiny, unstable and narrowly parochial states of Central and Eastern Europe, ensuring their inevitable strategic collisions with first Germany and then the Soviet Union – again, strategic misconceptions that echo with especial relevance today. Barnett most of all explored the crumbling and collapse of Britain’s once awesome industrial base. He put this down to a fatal, blind – indeed deluded – reliance on the workings of the free market without any government intervention, encouragement or protection for strategic industries. Britain practiced Free Trade from 1860 to 1931 except for the four years of World War I at the very same time its arch rivals Germany, the United States and Imperial Japan applied high industrial and agricultural tariffs and successfully developed their modern industries and rural economies, dramatically raising the standard of living of their peoples in the process. The British then, like the Americans today believed in Free Trade as an economic panacea blind to the avalanche of empirical, practical evidence to the contrary. Like modern Americans, they laid exaggerated importance on theoretical university education in the humanities and on liberal theories of economics and politics, while their ruling elites were pathetically ignorant of what today are known in the United States as the STEM subjects – Science, Technology, Engineering and Mathematics. It is therefore no coincidence that Margaret Thatcher, the only British leader to revive and stabilize her country’s economy and international standing since World War II, had worked professionally as a research scientist in the chemical industry. Thatcher also regarded Barnett as her favorite historian and raised him to the House of Lords as a Life Peer, an almost unprecedented honor for an academic British scholar. Today Thatcher is gone but Barnett lives on at a remarkable 91. He followed up his 1972 masterpiece with three searing sequels on how the British threw away the manufacturing advantages they still enjoyed after being rescued in World War II by the alliance and support of the United States and the Soviet Union. Those three later books, The Audit of War: The Illusion and Reality of Britain as a Great Nation (1986), known in the United States as The Pride and the Fall; The Lost Victory: British Dreams and British Realities, 1945-50 (Macmillan, 1995) and The Verdict of Peace: Britain between her Yesterday and the Future remain definitive works today. They are known collectively as The Pride and Fall Sequence. Ironically, Barnett greatly admired the America of the first half of the 20th century and held it up as an example of wise industrial, social, economic and strategic policies that Britain should have emulated but did not. Instead the opposite happened, the Americans following the end of the Cold War plunged precisely into the same mad and futile dreams of eternal global leadership as the British had done, dragging them inexorably into one vicious, morally reprehensible and financially exhausting little “colonial” war after another to crush emerging national, social and economic movements around the world. They failed repeatedly. Eventually these self-righteous and moralistic – but never moral – policies propelled Britain and its Empire into the one catastrophe they should have avoided at all costs – another world war. Barnett recognized the fateful path the United States had taken. In 2003, never fearful of controversy he was scathingly critical of the US invasion of Iraq and its claimed moral and grand strategic goals. Clio, Muse of History must have applauded. On 12 March 2018 the British Prime Minister Theresa May made her first statement to the House of Commons in which she alleged that the Skripals had been poisoned with a nerve agent “of a type developed by Russia,” and that it was “highly likely” Russia was responsible. A number of countries, including Australia, acceded to the British demand and expelled diplomats. The statement made by Prime Minister Malcolm Turnbull announcing that two Russian diplomats would be expelled made no attempt to establish the truth of the matter or indicate any desire to do so. His statement simply echoed the allegations made in the British document. Secondly, the former United Kingdom Foreign Secretary Boris Johnson told the Russian ambassador to the United Kingdom on 12 March 2018 that the nerve agent used on the Skripals was an A234. You are a number of problems with this claim quite apart from Mr Johnson’s general difficulty with the truth. The consulting surgeon at Salisbury Hospital, Dr Steven Davies had a letter to The Times newspaper published on 14 March 2018 in which he stated that “no patients have experienced symptoms of nerve agent poisoning in Salisbury.” In contradistinction to unsubstantiated claims that as many as 40 people had been affected, Dr Davies referred to only three patients receiving treatment in this context. This was presumably a reference to the two Skripals and a police officer. It would probably surprise most American friends of Israel to learn that Prime Minister Benjamin Netanyahu has visited Moscow three times so far this year, particularly as Russia has been getting vilified in the U.S. mainstream media on an almost daily basis. There is a reason for the Russophobia beyond what Moscow might or might not have done in the 2016 election. Russia has become a particular target of hostility for the burgeoning number of neoconservative foundations, also closely linked to Israel, whose funding from defense contractors depends on having a powerful enemy. The ability of Israel and its supporters to play both sides regardless of what the accepted perception of what American interests might be should therefore be an issue of some concern. In response to Israeli interests, the U.S. has sought regime change in Syria and has toyed with the creation of mini states within the country controlled by the Kurds and the so-called moderate rebels. It would mean the end of Syria as a nation, which has been an Israeli objective since 1967. Israel has been contributing to the turmoil by attacking targets inside Syria. The targets are generally described as either “Iranian” or “Hezbollah,” but they have also included Syrian Army installations. One such attack took place last week after a drone allegedly entered Israeli territory. Benjamin Netanyahu’s visits to Russia can be seen as efforts to get Moscow’s backing to push back against Iran, admittedly a Sisyphean task as both Russia and Iran are in Syria by invitation of the legitimate government and both have been critical to the success of Damascus’s successful counter-offensive. There are, however, differences in perception, as Moscow’s role has been limited and largely high-tech while Iran has supplied as many as 80,000 of the foot soldiers in the conflict. Russia would prefer that Syria not become an Iranian satrapy after the fighting is over. The US and Russian leaders will meet in an atmosphere of open animosity towards Russia in the West. In this context, the very fact of the meeting, which part of the US establishment sought to derail, could be deemed a success. A summit between US President Donald Trump and his Russian counterpart, Vladimir Putin, is a much-anticipated event and it is also long overdue. As unhinged Russophobia increasingly grips the West and relations between two of the world’s major powers hit a historic low since the Cold War, a meeting between the two leaders might at least slow down the continued slide towards even greater confrontation if not really improve the troubled relations between Moscow and Washington. The extraordinary circumstances surrounding this meeting make it a sort of victory of proponents of common sense over those who seek to push their own narrow interests at the expense of international relations and, eventually, global security. During his election campaign in 2016 and after his inauguration, Trump said repeatedly that he would like to have better relations with Russia, which had already soured on the last leg of Barack Obama’s second presidential term over Syria and Ukraine. His position that having good ties with Russia is better for the US brought on him the additional ire of the liberal ‘resistance’ and the establishment amid the Mueller probe into alleged election meddling and collusion that hasn’t produced much evidence, but generated high costs and daily debates. Trump’s presidency has seen further deterioration of relations between Moscow and Washington. When a diplomatic row began under the Obama administration and saw diplomats expelled, Russia chose not to retaliate, waiting for Trump’s actions. Under his administration, however, sanctions have been slapped on Moscow, diplomats have been expelled, and Russian diplomatic compounds have been searched. Moscow condemned Washington’s moves at that time, calling it the “behavior of raiders” and accusing the US of violating the Vienna Convention on Diplomatic Relations. The US ignored Russia’s objections and once again broke into a Russian diplomatic compound. This followed more expulsions in response to London’s baseless accusation that Moscow poisoned the former Russian double agent Sergei Skripal and his daughter in the UK. This time, the US also went so far as to boot out Russian diplomats working at the UN headquarters in New York, in what Moscow called a violation of international agreements. Coupled with unfettered Russophobia following the worst patterns of McCarthyism that swayed the minds of a significant part of the US establishment and the media community, this policy brought relations between the two countries to within a hair’s breadth of a red line separating political animosity from open conflict. The US named Russia among the major threats in its Nuclear Posture Review, and it sought ways to bypass one of the cornerstones of the international disarmament regime – the Intermediate-Range Nuclear Forces (INF) Treaty – all in the name of countering perceived “aggressive strategies” by Russia. It has therefore become clear that the US officials preoccupied with anti-Russian conspiracies, which they themselves contrived, have lost touch with reality and are ready to put the world on the brink of a new arms race, if not a new global war, in a bid to protect Washington’s dominance in the world. Even at the beginning of his presidency, Trump admitted that US-Russian relations had hit a historic low. Since that time, the situation has seemingly become much worse. With US-Russian relations reduced to “sporadic meetings between diplomats and military,” as Russian Foreign Minister Sergey Lavrov recently put it, a meeting that could overcome this confrontational narrative of bilateral relations by the mere fact of it taking place would have extreme significance. Even though the meeting apparently already has enough symbolic meaning to make holding it a worthy goal, both sides also have certain expectations of the event. Quite reasonably, Moscow sees the summit primarily as a way to just restore dialog between the two nations and add some common sense in bilateral relations. His words were partly echoed by the Russian president’s aide, Yury Ushakov, who said that the Kremlin sees the goal of the meeting as “changing the negative situation in relations between the US and Russia,” as well as “bringing mutual trust to some acceptable level.” However, Moscow is apparently also reluctant to set its hopes high as Ushakov said that the Russian side does not expect the two leaders to even issue a joint statement following the summit. Such a stance perfectly fits into Moscow’s general approach that involves readiness to “build bridges” with the US, which it prefers to see as a “partner” despite its “regrettable” security strategy. The US expectations for the summit, meanwhile, look much vaguer as Washington seemingly still cannot define its own attitude to its negotiating partner. Notably, neither Moscow nor Washington spoke about any concrete agreements that could be reached as a result of the talks, which makes one presume that, in a practical sense, the results of the summit would hardly be significant. “The main purpose of the meeting is to highlight the need to restore direct lines of communication at many levels between the US and Russian governments and civil society that were severed by the Obama administration following the Crimea referendum,” Gilbert Doctorow, political analyst and author, told RT. “There is a great deal to be accomplished in restoring normal, civilized relations between the two countries first,” he added. The US establishment as well as at least some of Washington’s Western allies have, meanwhile, spared no effort to prevent or at least spoil the forthcoming summit. The US media are almost competing to provide their audiences with most bizarre conspiracy theories about possible collusion between Trump and Putin as a renewed push to promote the narrative that has become increasingly threadbare over the last couple of years. In one of the most vivid examples of such dizzying feats, New York magazine claimed that the US leader was actually a Russian spy since at least 1987. The US neocons were also not too far behind the media as they suggested that US National Security Advisor John Bolton, who is actually known as an arch-hawk and war cheerleader, might well be Putin’s stooge just because he traveled to Moscow to discuss the details of the meeting between the two leaders. The crux of the matter was the US Justice Department’s announcement that 12 people identified as “Russian intelligence officers” had been indicted for hacking the Democratic Party and the Hillary Clinton campaign. The news conveniently came just days ahead of the meeting, prompting Moscow to say that the move was aimed at spoiling the upcoming summit in the Finnish capital of Helsinki. Meanwhile, on the other side of the Atlantic, the British establishment and journalists launched their own verbal assault on the Kremlin following yet another chemical incident on the British soil, even though the UK has so far provided no evidence linking even the March poisoning of Skripals to Moscow, not to mention the new incident, which was predictably immediately blamed on Russia without any proof being presented. “For the establishment, US-Russia enmity isn’t a means to an end – it is the end,” Jatras said, commenting on the issue. He told RT that Washington effectively sees Russia as “an obstacle to continued US global hegemony and the huge flows of money spread around, both at home and abroad, [used] to sustain it. “Anything less than endless hostility is a direct threat to the financial wellbeing and ideological core of a vast army of mandarins,” he added.